MT1/2 deficiency leads to exercise intolerance and cardiac dysfunction. MT1/2KO (KO) mice or 129SvJ WT controls were subjected to a 28 day swimming regimen. (A) Heart weight/tibia length (HW/TL) ratio of KO and WT animals reveals cardiac hypertrophy after 28-day swim but no significant difference due to loss of MT1/2. Echocardiographic determination of (B) ejection fraction, (C) fractional shortening, and (D) systolic volume indicates that systolic cardiac function is impaired in swim-trained KO mice. (E) Representative polarized light images of Picrosirius red staining of left ventricular free wall (LVFW) to evaluate fibrosis in swim-trained WT and KO animals. WT sedentary, n = 8; WT swim, n = 11; KO sedentary, n = 3; KO swim, n = 10. (F–H) Quantification of Picrosirius red staining from similar regions of the LVFW demonstrates increased fibrosis in the (F) interstitial, (G) epicardial, and (H) perivascular regions of KO animals. Pixel coverage was quantified to indicate area of fibrosis. WT swim, n = 3; KO swim, n = 5. 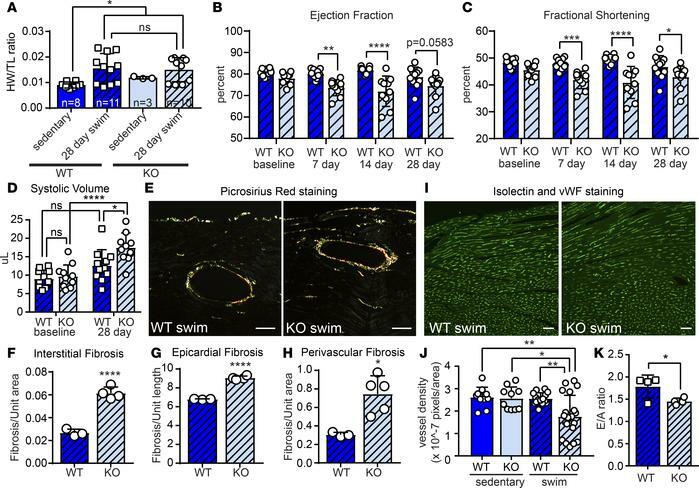 (I) Isolectin and von Willebrand Factor costaining of LVFW to evaluate vascularization in swim-trained WT and KO animals. Three to 5 regions of interest were quantified per animal. WT swim, n = 3; KO swim, n = 5. (J) Pixel density quantification reveals reduced vascularization in KO animals compared with controls. (K) Echocardiographic analysis of E/A ratio demonstrates impaired diastolic function in swim-trained WT and KO mice, n = 4. Statistics in F–H and K were performed using two-tailed Student’s t test. Statistics in B–D were performed using 2-way ANOVA and Tukey’s post-hoc test. Statistics in A were performed using 1-way ANOVA and Tukey’s post-hoc test. *P < 0.05, **P < 0.01, ***P < 0.001, ****P < 0.0001. Scale bars: 50 μm.